Observationally, an asymptotic-giant-branch star will appear as a bright red giant with a luminosity ranging up to thousands of times greater than the Sun. Its interior structure is characterized by a central and largely inert core of carbon and oxygen, a shell where helium is undergoing fusion to form carbon (known as helium burning), another shell where hydrogen is undergoing fusion forming helium (known as hydrogen burning), and a very large envelope of material of composition similar to main-sequence stars. When a star exhausts the supply of hydrogen by nuclear fusion processes in its core, the core contracts and its temperature increases, causing the outer layers of the star to expand and cool. The star becomes a red giant, following a track towards the upper-right hand corner of the HR diagram. Eventually, once the temperature in the core has reached approximately 7008300000000000000♠3×108 K, helium burning (fusion of helium nuclei) begins. The onset of helium burning in the core halts the star's cooling and increase in luminosity, and the star instead moves down and leftwards in the HR diagram. This is the horizontal branch (for population II stars) or red clump (for population I stars), or a blue loop for stars more massive than about 2 M☉. After the completion of helium burning in the core, the star again moves to the right and upwards on the diagram, cooling and expanding as its luminosity increases. Its path is almost aligned with its previous red-giant track, hence the name asymptotic giant branch, although the star will become more luminous on the AGB than it did at the tip of the red giant branch. Stars at this stage of stellar evolution are known as AGB stars. The AGB phase is divided into two parts, the early AGB (E-AGB) and the thermally pulsing AGB (TP-AGB). During the E-AGB phase, the main source of energy is helium fusion in a shell around a core consisting mostly of carbon and oxygen. During this phase, the star swells up to giant proportions to become a red giant again. The star's radius may become as large as one astronomical unit (~215 R☉). After the helium shell runs out of fuel, the TP-AGB starts. Now the star derives its energy from fusion of hydrogen in a thin shell, which restricts the inner helium shell to a very thin layer and prevents it fusing stably. However, over periods of 10,000 to 100,000 years, helium from the hydrogen shell burning builds up and eventually the helium shell ignites explosively, a process known as a helium shell flash. The luminosity of the shell flash peaks at thousands of times the total luminosity of the star, but decreases exponentially over just a few years. The shell flash causes the star to expand and cool which shuts off the hydrogen shell burning and causes strong convection in the zone between the two shells. When the helium shell burning nears the base of the hydrogen shell, the increased temperature reignites hydrogen fusion and the cycle begins again. The large but brief increase in luminosity from the helium shell flash produces an increase in the visible brightness of the star of a few tenths of a magnitude for several hundred years, a change unrelated to the brightness variations on periods of tens to hundreds of days that are common in this type of star. During the thermal pulses, which last only a few hundred years, material from the core region may be mixed into the outer layers, changing the surface composition, a process referred to as dredge-up. Because of this dredge-up, AGB stars may show S-process elements in their spectra and strong dredge-ups can lead to the formation of carbon stars. All dredge-ups following thermal pulses are referred to as third dredge-ups, after the first dredge-up, which occurs on the red-giant branch, and the second dredge up, which occurs during the E-AGB. In some cases there may not be a second dredge-up but dredge-ups following thermal pulses will still be called a third dredge-up. Thermal pulses increase rapidly in strength after the first few, so third dredge-ups are generally the deepest and most likely to circulate core material to the surface. AGB stars are typically long-period variables, and suffer mass loss in the form of a stellar wind. Thermal pulses produce periods of even higher mass loss and may result in detached shells of circumstellar material. A star may lose 50 to 70% of its mass during the AGB phase. The extensive mass loss of AGB stars means that they are surrounded by an extended circumstellar envelope (CSE). Given a mean AGB lifetime of one Myr and an outer velocity of 7004100000000000000♠10 km/s, its maximum radius can be estimated to be roughly 7017300000000000000♠3×1014 km (30 light years). This is a maximum value since the wind material will start to mix with the interstellar medium at very large radii, and it also assumes that there is no velocity difference between the star and the interstellar gas. Dynamically, most of the interesting action is quite close to the star, where the wind is launched and the mass loss rate is determined. However, the outer layers of the CSE show chemically interesting processes, and due to size and lower optical depth, are easier to observe. The dichotomy between oxygen-rich and carbon-rich stars has an initial role in determining whether the first condensates are oxides or carbides, since the least abundant of these two elements will likely remain in the gas phase as COx. In the dust formation zone, refractory elements and compounds (Fe, Si, MgO, etc.) are removed from the gas phase and end up in dust grains. The newly formed dust will immediately assist in surface catalyzed reactions. The stellar winds from AGB stars are sites of cosmic dust formation, and are believed to be the main production sites of dust in the universe. The stellar winds of AGB stars (Mira variables and OH/IR stars) are also often the site of maser emission. The molecules that account for this are SiO, H2O, OH, HCN, and SiS. SiO, H2O, and OH masers are typically found in oxygen-rich M-type AGB stars such as R Cassiopeiae and U Orionis, while HCN and SiS masers are generally found in carbon stars such as IRC +10216. S-type stars with masers are uncommon. After these stars have lost nearly all of their envelopes, and only the core regions remain, they evolve further into short-lived preplanetary nebulae. The final fate of the AGB envelopes are represented by planetary nebulae (PNe). As many as a quarter of all post-AGB stars undergo what is dubbed a "born-again" episode. The carbon–oxygen core is now surrounded by helium with an outer shell of hydrogen. If the helium is re-ignited a thermal pulse occurs and the star quickly returns to the AGB, becoming a helium-burning, hydrogen-deficient stellar object. If the star still has a hydrogen-burning shell when this thermal pulse occurs, it is termed a "late thermal pulse". Otherwise it is called a "very late thermal pulse". 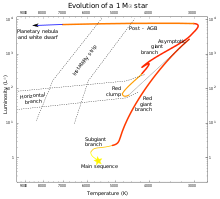 The outer atmosphere of the born-again star develops a stellar wind and the star once more follows an evolutionary track across the Hertzsprung–Russell diagram. However, this phase is very brief, lasting only about 200 years before the star again heads toward the white dwarf stage. Observationally, this late thermal pulse phase appears almost identical to a Wolf–Rayet star in the midst of its own planetary nebula. Stars such as Sakurai's Object and FG Sagittae are being observed as they rapidly evolve through this phase. Stars close to the upper mass limit to still qualify as AGB stars show some peculiar properties and have been dubbed super-AGB stars. They have masses above 7 M☉ and up to 9 or 10 M☉ (or more). They represent a transition to the more massive supergiant stars that undergo full fusion of elements heavier than helium. During the triple-alpha process, some elements heavier than carbon are also produced: mostly oxygen, but also some magnesium, neon, and even heavier elements. Super-AGB stars develop partially degenerate carbon–oxygen cores that are large enough to ignite carbon in a flash analogous to the earlier helium flash. The second dredge-up is very strong in this mass range and that keeps the core size below the level required for burning of neon as occurs in higher-mass supergiants. The size of the thermal pulses and third dredge-ups are reduced compared to lower-mass stars, while the frequency of the thermal pulses increases dramatically. Some super-AGB stars may explode as an electron capture supernova, but most will end as an oxygen–neon white dwarf. Since these stars are much more common than higher-mass supergiants, they could form a high proportion of observed supernovae. Detecting examples of these supernovae would provide valuable confirmation of models that are highly dependent on assumptions. ^ Lattanzio, J.; Forestini, M. (1999). "Nucleosynthesis in AGB Stars". In Le Bertre, T.; Lebre, A.; Waelkens, C. (eds.). Asymptotic Giant Branch Stars. IAU Symposium 191. p. 31. Bibcode:1999IAUS..191...31L. ISBN 978-1-886733-90-9. ^ Iben, I. (1967). "Stellar Evolution.VI. Evolution from the Main Sequence to the Red-Giant Branch for Stars of Mass 1 M☉, 1.25 M☉, and 1.5 M☉". The Astrophysical Journal. 147: 624. Bibcode:1967ApJ...147..624I. doi:10.1086/149040. ^ a b c d Vassiliadis, E.; Wood, P. R. (1993). "Evolution of low- and intermediate-mass stars to the end of the asymptotic giant branch with mass loss". The Astrophysical Journal. 413 (2): 641. Bibcode:1993ApJ...413..641V. doi:10.1086/173033. ^ Marigo, P.; et al. (2008). "Evolution of asymptotic giant branch stars. II. Optical to far-infrared isochrones with improved TP-AGB models". Astronomy and Astrophysics. 482 (3): 883–905. arXiv:0711.4922. Bibcode:2008A&A...482..883M. doi:10.1051/0004-6361:20078467. ^ Gallino, R.; et al. (1998). "Evolution and Nucleosynthesis in Low‐Mass Asymptotic Giant Branch Stars. II. Neutron Capture and thes‐Process". The Astrophysical Journal. 497 (1): 388–403. Bibcode:1998ApJ...497..388G. doi:10.1086/305437. ^ Mowlavi, N. (1999). "On the third dredge-up phenomenon in asymptotic giant branch stars". Astronomy and Astrophysics. 344: 617. arXiv:astro-ph/9903473. Bibcode:1999A&A...344..617M. ^ Habing, H. J. (1996). "Circumstellar envelopes and Asymptotic Giant Branch stars". The Astronomy and Astrophysics Review. 7 (2): 97–207. Bibcode:1996A&ARv...7...97H. doi:10.1007/PL00013287. ^ Klochkova, V. G. (2014). "Circumstellar envelope manifestations in the optical spectra of evolved stars". Astrophysical Bulletin. 69 (3): 279–295. arXiv:1408.0599. Bibcode:2014AstBu..69..279K. doi:10.1134/S1990341314030031. ^ Sugerman, Ben E. K.; Ercolano, Barbara; Barlow, M. J.; Tielens, A. G. G. M.; Clayton, Geoffrey C.; Zijlstra, Albert A.; Meixner, Margaret; Speck, Angela; Gledhill, Tim M.; Panagia, Nino; Cohen, Martin; Gordon, Karl D.; Meyer, Martin; Fabbri, Joanna; Bowey, Janet. E.; Welch, Douglas L.; Regan, Michael W.; Kennicutt, Robert C. (2006). "Massive-Star Supernovae as Major Dust Factories". Science. 313 (5784): 196–200. arXiv:astro-ph/0606132. Bibcode:2006Sci...313..196S. doi:10.1126/science.1128131. PMID 16763110. ^ Deacon, R. M.; Chapman, J. M.; Green, A. J.; Sevenster, M. N. (2007). "H2O Maser Observations of Candidate Post‐AGB Stars and Discovery of Three High‐Velocity Water Sources". The Astrophysical Journal. 658 (2): 1096. arXiv:astro-ph/0702086. Bibcode:2007ApJ...658.1096D. doi:10.1086/511383. ^ Humphreys, E. M. L. (2007). "Submillimeter and millimeter masers". Astrophysical Masers and Their Environments, Proceedings of the International Astronomical Union, IAU Symposium. 242 (1): 471–480. arXiv:0705.4456. Bibcode:2007IAUS..242..471H. doi:10.1017/S1743921307013622. ^ Fonfría Expósito, J. P.; Agúndez, M.; Tercero, B.; Pardo, J. R.; Cernicharo, J. (2006). "High-J v=0 SiS maser emission in IRC+10216: A new case of infrared overlaps". The Astrophysical Journal. 646 (1): L127. arXiv:0710.1836. Bibcode:2006ApJ...646L.127F. doi:10.1086/507104. ^ Schilke, P.; Mehringer, D. M.; Menten, K. M. (2000). "A submillimeter HCN laser in IRC+10216". The Astrophysical Journal. 528 (1): L37. arXiv:astro-ph/9911377. Bibcode:2000ApJ...528L..37S. doi:10.1086/312416. ^ Schilke, P.; Menten, K. M. (2003). "Detection of a second, strong submillimeter HCN laser line towards carbon stars". The Astrophysical Journal. 583 (1): 446. Bibcode:2003ApJ...583..446S. doi:10.1086/345099. ^ a b Engels, D. (1979). "Catalogue of late-type stars with OH, H2O or SiO maser emission". Astronomy and Astrophysics Supplement Series. 36: 337. Bibcode:1979A&AS...36..337E. ^ Werner, K.; Herwig, F. (2006). "The Elemental Abundances in Bare Planetary Nebula Central Stars and the Shell Burning in AGB Stars". Publications of the Astronomical Society of the Pacific. 118 (840): 183–204. arXiv:astro-ph/0512320. Bibcode:2006PASP..118..183W. doi:10.1086/500443. ^ a b Aerts, C.; Christensen-Dalsgaard, J.; Kurtz, D. W. (2010). Asteroseismology. Springer. pp. 37–38. ISBN 978-1-4020-5178-4. ^ Duerbeck, H. W. (2002). "The final helium flash object V4334 Sgr (Sakurai's Object) - an overview". In Sterken, C.; Kurtz, D. W. (eds.). Observational aspects of pulsating B and A stars. ASP Conference Series. 256. San Francisco: Astronomical Society of the Pacific. pp. 237–248. Bibcode:2002ASPC..256..237D. ISBN 1-58381-096-X. Langer, N. "Late evolution of low- andintermediate-mass stars" (PDF). Stars and Stellar evolution lecture notes. University of Bonn/Argelander-Institut für Astronomie. Habing, H. J.; Olofsson, H. (2004). Asymptotic Giant Branch Stars. Springer. ISBN 978-0-387-00880-6. McCausland, R. J. H.; Conlon, E. S.; Dufton, P. L.; Keenan, F. P. (1992). "Hot post-asymptotic giant branch stars at high galactic latitudes". The Astrophysical Journal. 394 (1): 298–304. Bibcode:1992ApJ...394..298M. doi:10.1086/171582.